Let’s be honest, OK? Traveling with a young child is a hassle. You need to maintain their schedule, or suffer the consequences. You need to pack and carry a lot of stuff. You are paying for experiences they will likely not even remember. But the compounding benefits of a well-traveled child will, I believe, serve both kids and parents. When traveling with kids, fountains are your friend. In the past few months we’ve taken several short trips from our home base in the middle of Germany. We’ve been to Berlin, London, Dublin and Salzburg and I can confidently say we had a great time in each of those places. A fair amount of preparation, a little luck and a surprise or two helped make each excursion fairly painless for all involved. 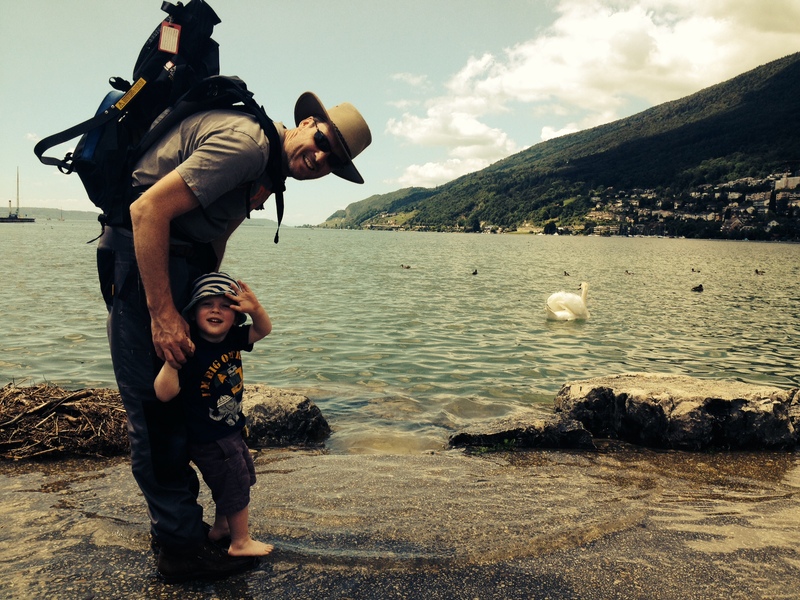 Here’s why traveling with a young child can really rock. 1. Hospitality professionals are great with kids. We flew on eight Lufthansa flights recently and on each one, E was greeted enthusiastically by the flight crew. They made him feel special and he was given a different game or toy on every flight. We’re still playing with the LEGO plane and pilot he received. We hit the jackpot with several hotels. 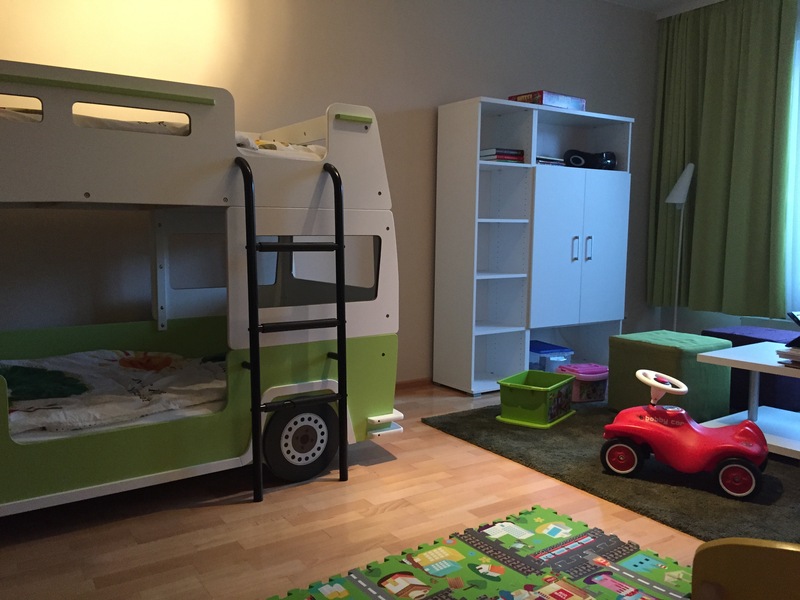 The ApartHotel in Berlin offers a family suite with a separate kids’ bedroom, a washing machine(! ), a full kitchen with kid-sized utensils and an immense breakfast buffet. 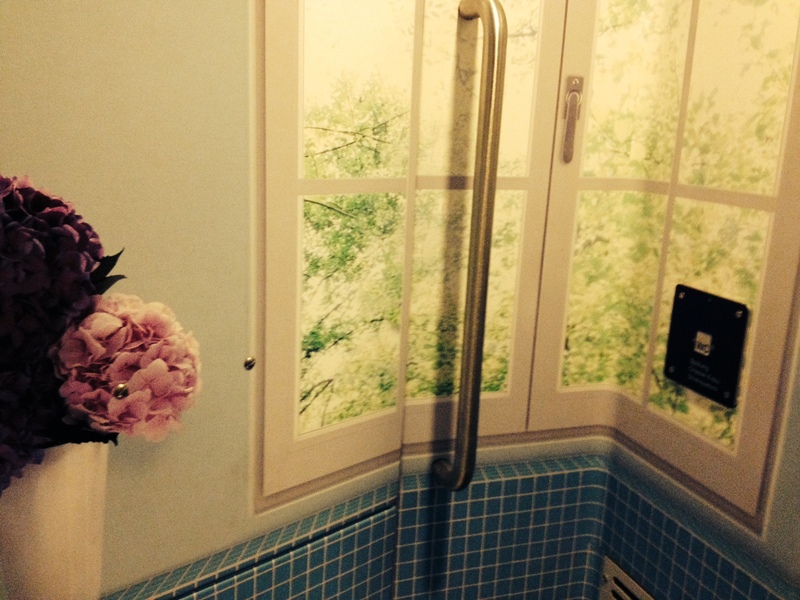 The amazing family suite at the ApartHotel in Berlin. In London, we stayed at the St. James Court where E was presented with a backpack at check-in. Inside were colored pencils and a coloring book, games, and a teddy bear dressed like one of the Queen’s guards. While not billed specifically as a kid-friendly hotel, the Dylan in Dublin had the most amazing staff I’ve ever encountered as a parent. The waiter we saw at breakfast greeted E by name each day and brought us little extras, like fruit already cut into bite-sized pieces and small glasses of milk. When E had a melt-down one morning and I removed him from the restaurant, the two gentlemen at the front desk (fathers of young children themselves, we discovered) offered to open up the private lounge so I could have a space to myself to help him calm down. They also chatted with E each afternoon about his day and gave us lots of family-friendly tips for restaurants and activities. Many tourist attractions hold little enchantment for young children, but neighborhood playgrounds, cafes, parks and zoos always fit the bill. 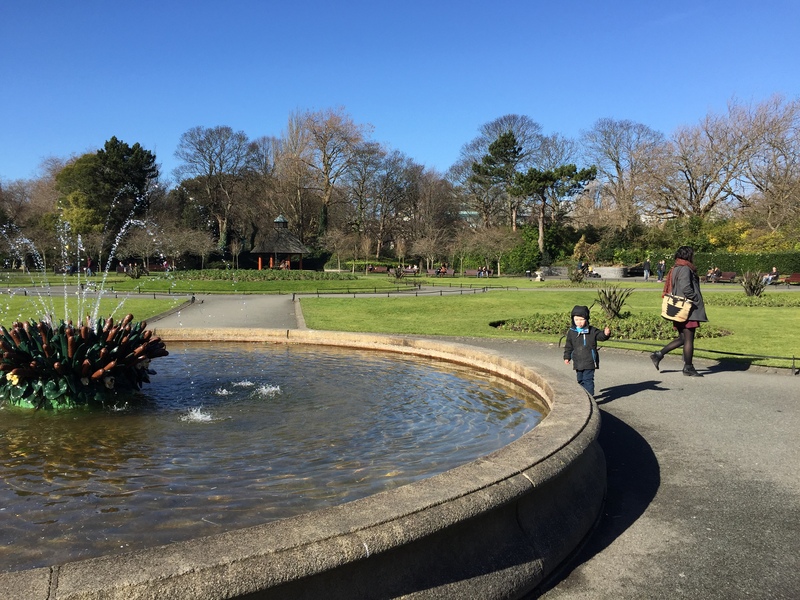 We scouted nearby playgrounds and walking trails in each city and every time ended up chatting with local families who gave us tips about places to eat and things to do. Our own insiders guide and new friends for E to boot! 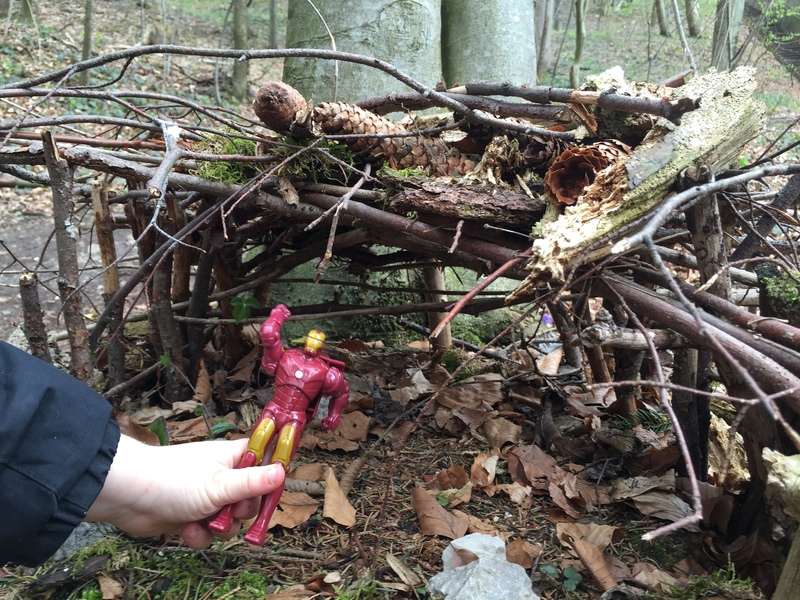 Iron Man discovered this fairy house on a hike far off the tourist trail. Forget the whirlwind tour of historical highlights. Kids force you to slow down and take in your surroundings in bite-size portions. You won’t hit all the big tourist spots, but you’ll find things you never would have seen if you followed the guidebook. Lingering in front of the main tourist attractions in Salzburg led to a fascinating conversation about puppetry with one of the performers. Hitting the local pub before the evening rush led to a lengthy chat with our server and some new and tasty discoveries. A simple afternoon walk to get the wiggles out led to a pretty neighborhood with a quiet canal and plenty of ducks to feed. London’s free museum admission is perfect for families. However long (or short) the time you spend, you don’t have to worry about getting your money’s worth. My grand plan to hit three museums in one afternoon fell apart when E became so enchanted with the Science Museum that we spent five hours exploring the hands-on areas. But he was happy, I was happy and there was no reason to hustle him to the next destination. 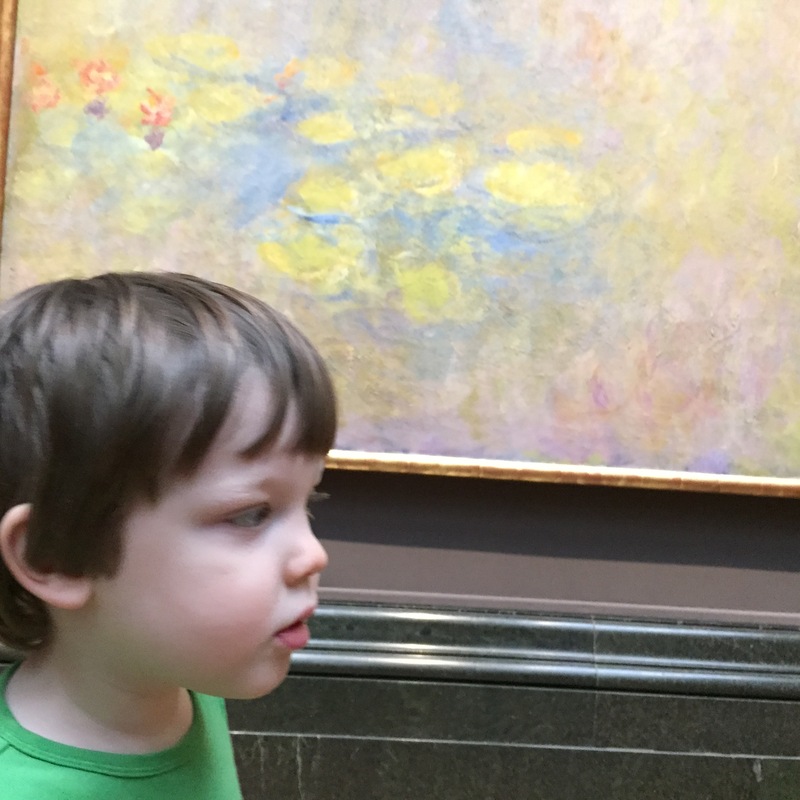 And when a short rain shower delayed a meet up at the end of the day, a quick duck into the National Portrait Gallery turned into E’s first introduction to several great masters–without any guilt that it only lasted 15 minutes. So it’s true, we didn’t tour Mozart’s house, kiss the Blarney Stone, see the Crown Jewels or visit Museum Island. But we did hike to a castle, splash in fountains, eat shepherd’s pie, touch the Berlin Wall, and stand before Big Ben as it struck 12. And those are the memories I want and that I hope to keep on creating. Full disclosure: Some of our accommodations were part of business travel, and therefore not paid by us personally. However, we received no special treatment or compensation for our stay at any of the hotels listed above and all opinions are my own and based on my personal experience. 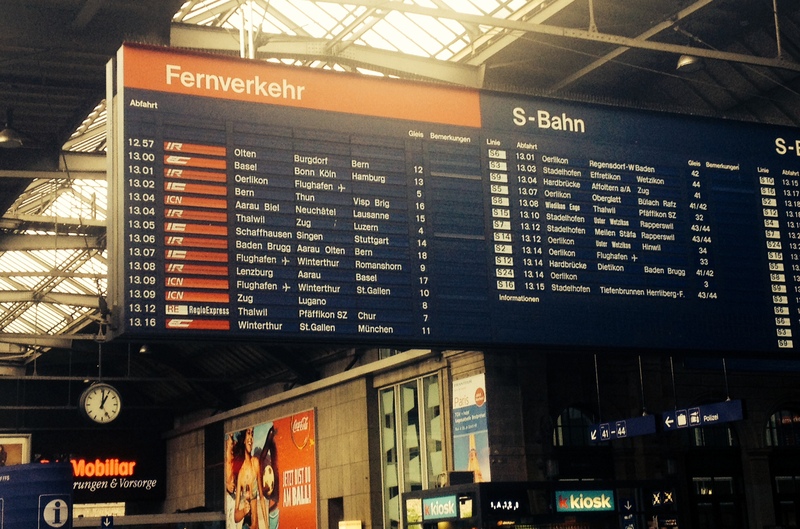 Fast, fun and always on time, trains are the perfect way to travel in Switzerland. Can you love a railway? If it’s possible, then I truly do. The Swiss train system embodies everything I appreciate about Switzerland: efficient, reliable, safe, accessible, adventurous and oh-so-family friendly. Now I admit it is also very Swiss in one other way: it is not cheap. But for our family, I can say that we easily got our money’s worth. A pass for unlimited travel for 30 days, which also allowed both kids to ride for free, meant that we could hop on a train simply because we felt like it or because a town on the map had an interesting name. And it covered more than trains. Every bus route was covered as well and any ferry or funicular we happened upon was covered as well. The train pass also gave us free or reduced admission to most museums and historical attractions. When you get to the station, just look up to find the big board with the most up-to-date information. Bathrooms feature murals to help you forget–at least for a moment–that you’re in a tiny, public, moving restroom. But here is the real kicker, and why I think the train pass is worth every penny. Almost every major train route has a “family zone” car on it. Which means all the people with little kids congregate onto the one car and no one cares if your kid if loud or cranky or super social or whatever. Your kid might even make some new friends and you might too! And best of all, on the popular long-haul routes the family zone is the top floor or a double-decker car and IT HAS A PLAYGROUND! Let me repeat: A PLAYGROUND ON A TRAIN! Go ahead and let ’em run. 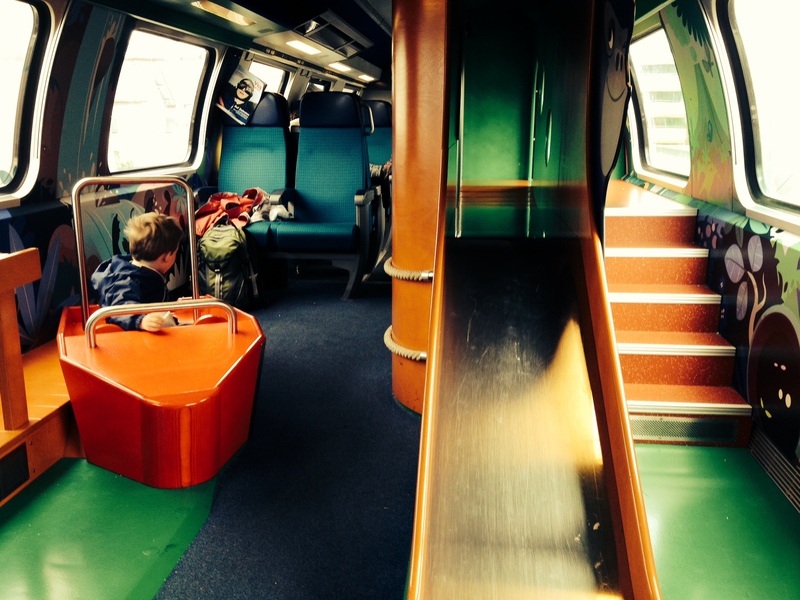 The playground on the upper level of the train car will keep kids entertained on long-haul journeys. With a slide, small climbing area, tunnel, play boat and dock, little kids will be able to burn off energy in a safe and enclosed area without bothering anyone else. There are also tables with board games printed on them for older kids and more space for stroller parking on the floor below. Even if your kid doesn’t run around the entire trip, just having the peace of mind that they can get up and move around whenever they wish is huge. A hot dog and a window seat. What more could a kid ask for? When it comes to family travel, the trains make Switzerland a great choice for people who want to get the very most out of their European visit. Merci vilmal Switzerland! Certainly one of the most interesting things about Switzerland is how the country is segmented into sections not only by geography, but by language and culture as well. When these regions meet up, the result can be fascinating. 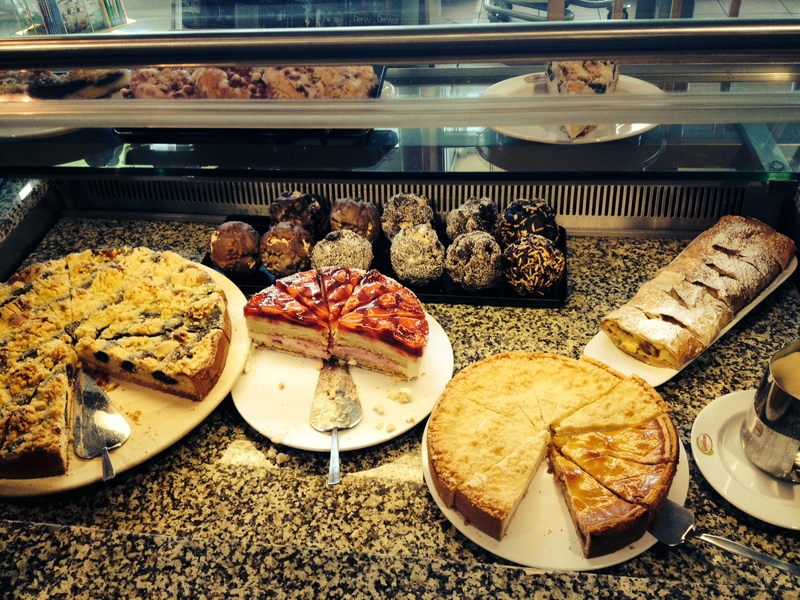 In Biel/Bienne, you can choose German or French food as the mood strikes you. The city is equally divided by both language and culture. 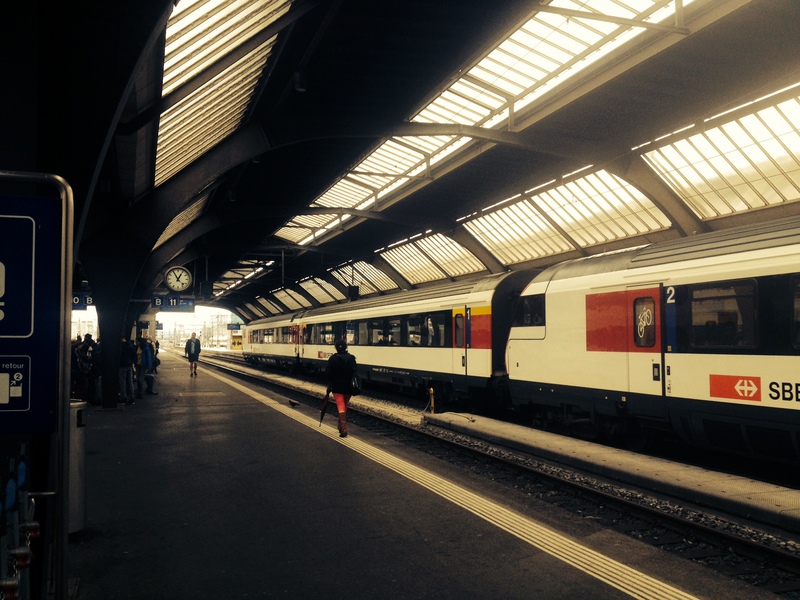 We hopped on the train to Biel/Bienne, a city that is so perfectly divided between French and German that it is officially referred to by both versions of its name. A small city known for watch-making (80s flashback alert: We strolled right past the headquarters for Swatch!) 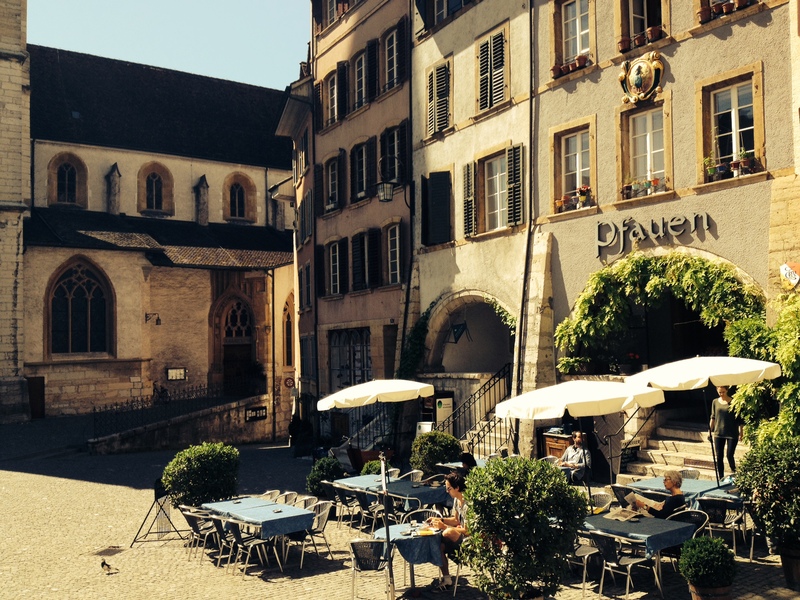 Biel/Bienne has a lovely lakefront, abundant shopping and a charming old town. 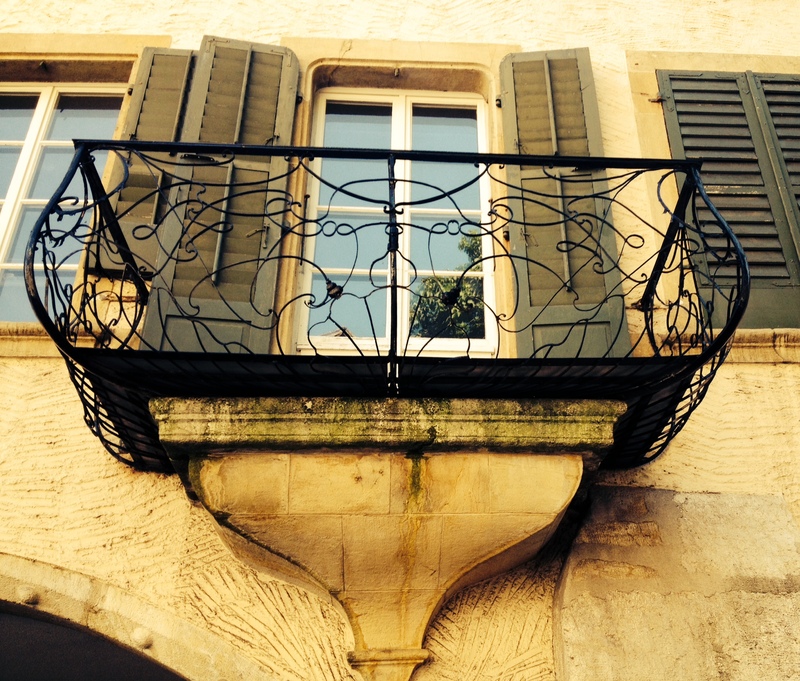 Around every corner of the Old Town, ornate balconies cast intricate shadows on the street below. The city was easy to navigate once we got the hang of it, making it a great family outing. Everything radiates away from the main train station: First the modern shops, located on many pedestrian-only roads and full of buskers. We heard classical violinists, a four-piece horn band, guitarists, and a guy with an accordion. Then we crossed the street into old town, full of open-by-appointment antique and collectable shops, restaurants and bookstores. There was a small outdoor market underway when we were there (hooray!) so we picked up some snacks and walked around. The entire city has signage in both German and French and most residents speak both, plus English, so we were well-covered no matter who we encountered. 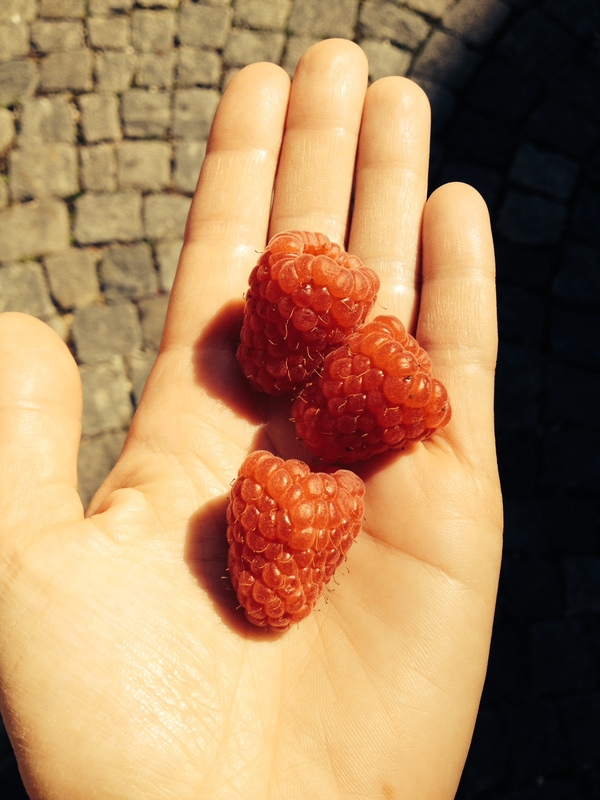 The biggest, sweetest raspberries I’ve ever had. A perfect walking-around-town snack! 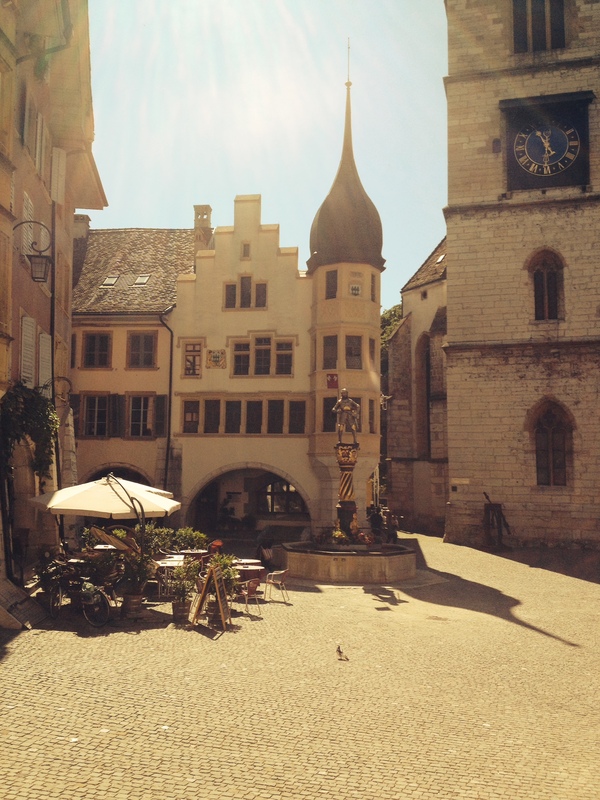 From old town we followed the main canal through the city until it ended at Lake Biel/Bienne. The waterfront has everything you could ask for: large dinner cruise boats, a swimming beach, playground, marina, snack bars, walking paths, wide lawns for picnics or sunbathing, foot bridges and swans. Lots of swans. See that Swan in the background? He’s already spotted his mark and is ready to make his move. While they might look all pristine and romantic, these are really just big ducks who are used to being fed so if you happen to have some croissant crumbs on your shirt or a pretzel in your hand, be warned. These guys mean business. It was a 4+ hour drive from our weekend in Germany back to Switzerland. At some point we were going to need food, bathrooms and a coffee. I had planned on just making do with the many highway rest stops along the autobahn and some snacks I had in my bag, but fate intervened. We pulled in at a gas station that had adjacent restaurants. There was a Burger King, some sort of buffet, and a coffee bar. But this was very different than the truck stops in the U.S. Forget the Twinkies and day-old donuts. These were just some of the choices at the gas station dessert buffet. We sat in a cozy corner with leather chairs and a gas fireplace (I’m guessing we were in the “coffee shop” area?) Ken had ordered a meal from the buffet for us to share. Good thing. 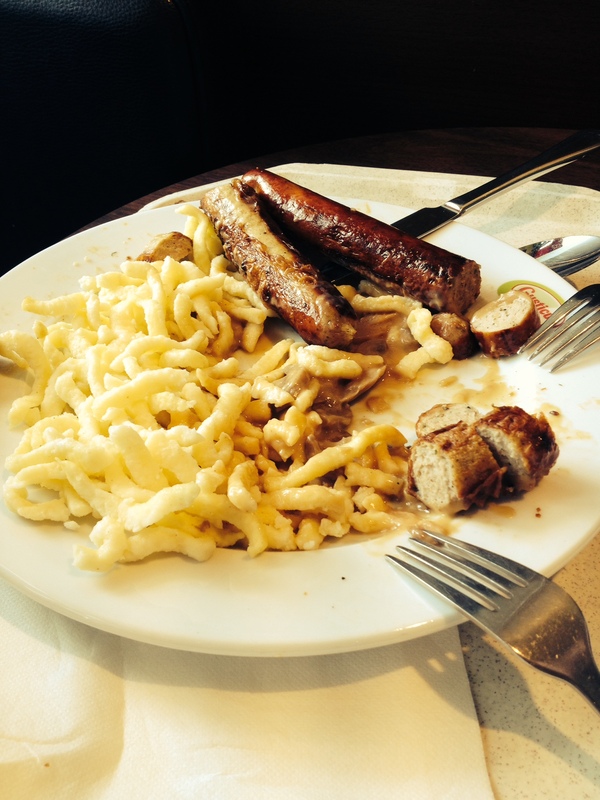 This plate of sausages and spaetzle was enormous. Two adults and a toddler could not finish it. So. Much. Food. But pretty darn tasty! 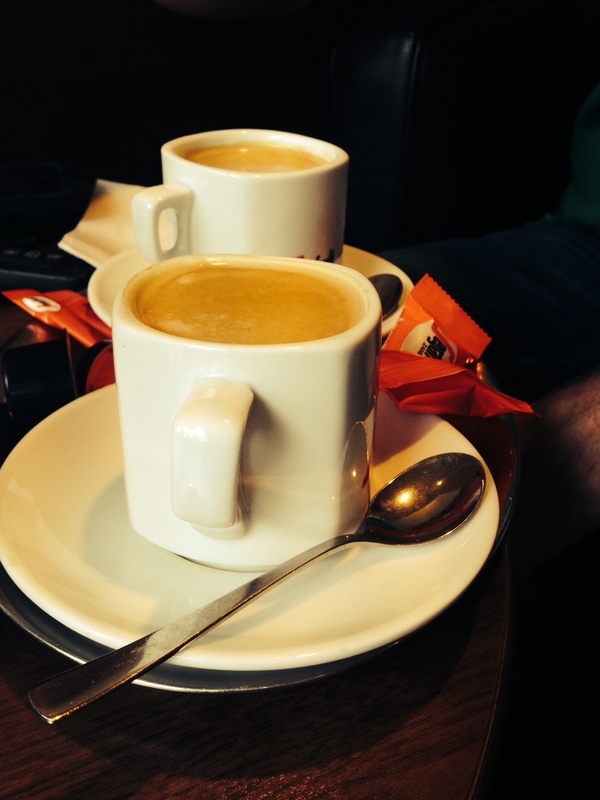 We also enjoyed some great coffee, served with little almond cookies on the side. It felt very refined considering we were in the shadow of dozens of parked semis and a few tour buses of elderly tourists. A cup of coffee and we were ready to get back on the road. To really cap off the experience, there were the restrooms. Accessible through a turnstile after paying a small fee, the bathrooms were sparkling clean and it’s no wonder. They have robotics! It took me a few tries to figure out the cleaning vs. flushing thing, but it was so entertaining it hardly mattered. I was so surprised, I forgot to take a picture or a video, but luckily other people have found it equally fascinating. After several flights with E, I’ve developed a few rules for our carry-on bags to help make our journeys more enjoyable. While every flight is different, and needs change as E grows, we have a few tried-and-true items we never leave home without. Will they eliminate the possibility of melt-downs? No. Will they end all boredom and wiggling? No. But hopefully they will give us at least a bit of peace and quiet and keep us from being that family on the plane. 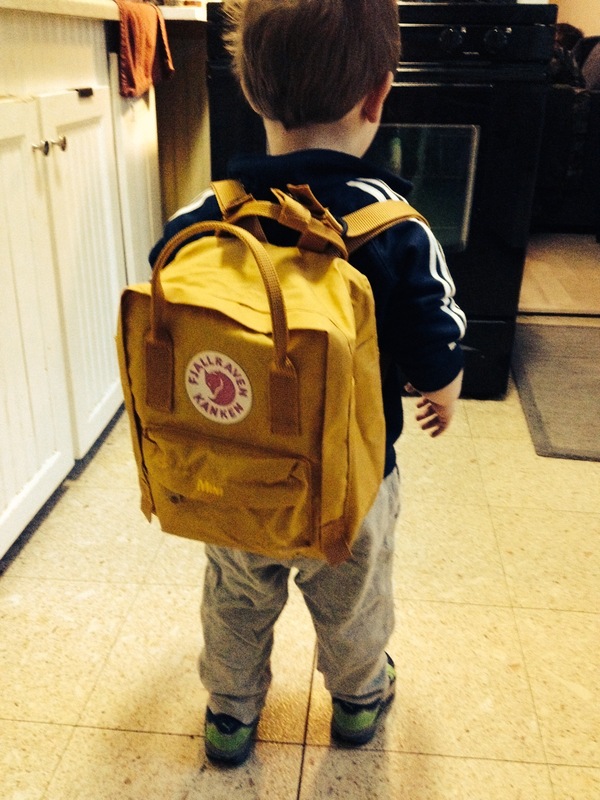 Kid’s backpack, perfect for long trips and short hops. It is mini-sized, so it won’t make him top-heavy. The top handles make it easy for me to grab if I need to keep him out of harm’s way. 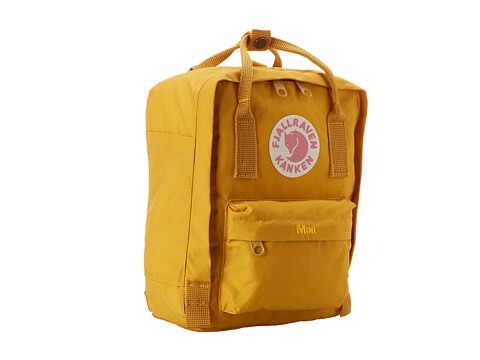 The bright color makes him easy to spot and and the backpack hard to accidentally leave behind. 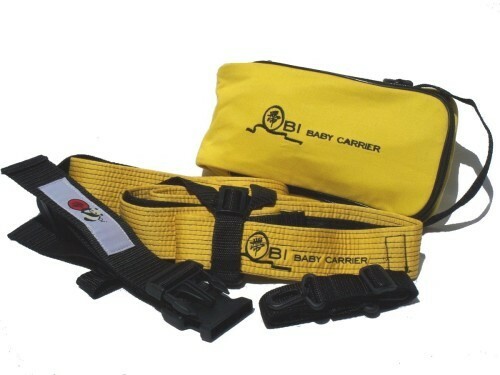 The straps adjust all the way to grown-up length, so if he decides to ditch it, I can put it on and keep my hands free. It doesn’t hold a lot, which I think is a good thing. He can find what he’s looking for and there aren’t’ so many items that I can’t keep track of them when he invariably pulls them all out and dumps then on the floor. I carry my trusty L.L. Bean Quad backpack which has traveled with us on several trips and holds an amazing amount of gear and flotsam. Will we forget something? Of course! But we are not traveling to a remote or desolate destination. We’re traveling to a major international airport. As long as we have enough diapers to get us through any delayed flights and tarmac-sitting, I think we will be OK. Anytime is nap time with the right gear. When you’re even a bit off the beaten path, the big SUV stroller isn’t going to cut it. While great for malls, sidewalks and airports, we have dirt paths, cobblestone streets and tight quarters ahead of us. The little legs of a three-footer can only go so far–or too far. 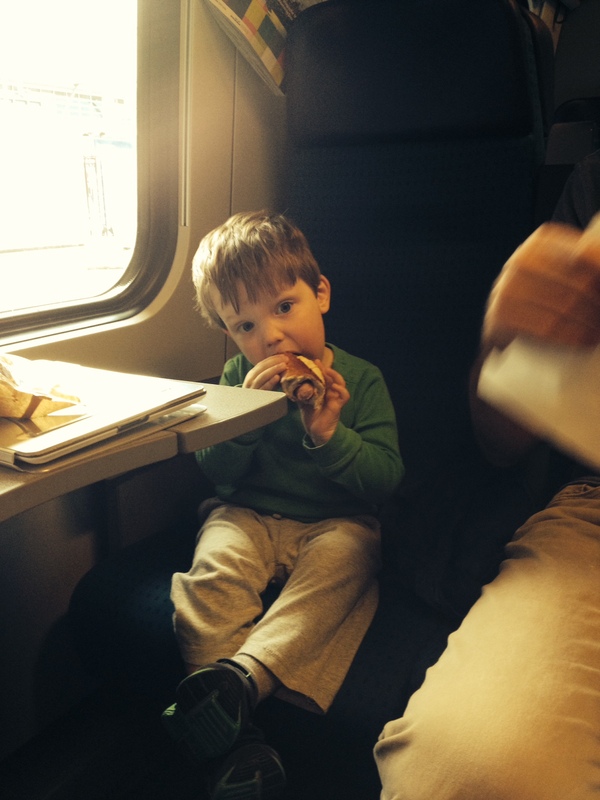 Traveling with toddlers means both energy and containment are going to be issues. We do have an umbrella stroller for some outings and city exploration (a completely disposable one purchased on sale for $20 at Target. And bonus: it looks like a shark so E truly enjoys riding in it.) 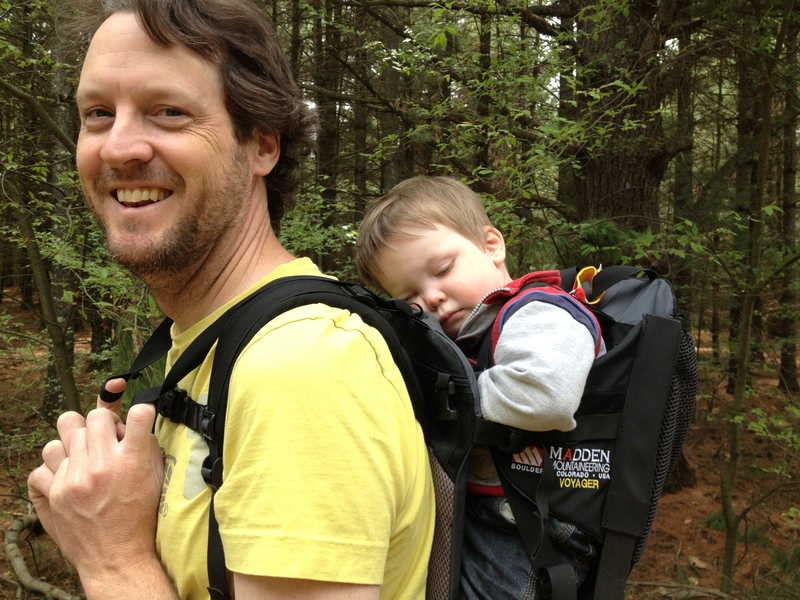 But for the most part, we have found the secret to toddler travel success is a really sturdy backpack. Even better, ours was a hand-me-down from a similarly adventurous family. So it was road tested, yet still in terrific shape. We carried E along mountain trails, zig-zagged through street festivals and up and down dozens of flights of stairs without a problem. He got a great view, up and away from dirt, feet and dogs. He often fell asleep in it, which while not ideal, is of course better than no nap at all. And it help a TON in the storage pocket, so all the diaper stuff, bottles and toys were with E, which meant the parents could split up without accidentally stranding one with a fussy baby and no supplies. I’ve seen a few other products that are worth exploring. This belt system from Obi-Baby-Carrier seems to work for bigger kids and eliminates the bulk of the backpack, which would be great during the to-and-from. It’s compact enough to throw into your daybag as an option for kids who get tired along the way.